It’s strange to think that the ground never stops moving. It’s moving even now. Coastlines erode. Dunes creep. Islands wander. Mountains fold and buckle over one another, inaudible. Most of the time, though, we hardly notice. After all, we people are small. Our lives are short, and spent close to the dirt. This is what occurs to me, at least, while viewing Santa Barbara photographer Bill Dewey’s exhibit “Coast to Carrizo: Aerial Photographs of San Luis Obispo County”—currently hanging at the San Luis Obispo Museum of Art—while the artist himself accompanies me, explaining about tectonic plates. A pilot since 1981 and a photographer since the early ’70s, Dewey produces work that shows the relative fluidity of the local landscape while creating compositions that are disorienting and beautiful in their own right. “Coast to Carrizo” walks the line between documentation and a kind of abstract painting done with a camera in the sky. Viewers will recognize Morro Rock, the Oceano dunes, and the oak-spotted hills of Paso Robles, but the most dramatic character in the exhibit is the San Andreas Fault. 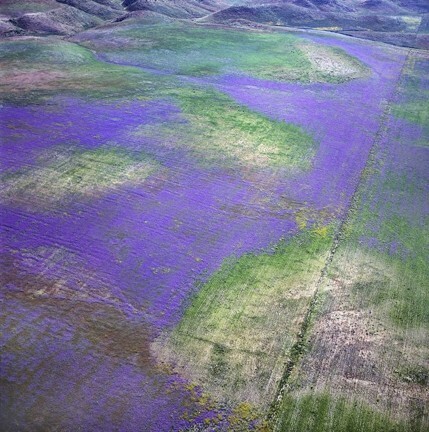 The ever-changing Carrizo Plain, where the fault is most easily observed, features prominently as well, often blooming with lush purple flowers, as in Carrizo’s Flower Carpet. Dewey’s Fault Marks Near Cholame shows great jagged scars in the gray earth, which, owing to the overhead vantage point, could just as easily be protrusions as depressions. The ground around the marks seems to shine a dull silver. It’s helpful that most pieces in “Coast to Carrizo” are so straightforwardly named. Before its title orients it, Fault Marks registers less as an image of a changing landscape and more as an exploration of shape and texture. Dewey’s photographs also reveal how civilization interacts with the natural landscape. His Encroachment of the Dunes shows how the city prevents the dunes from continuing their steady migration inland. Is there a conservationist message here? Perhaps, but Dewey seems just as interested in finding the beauty in natural and man-made changes. 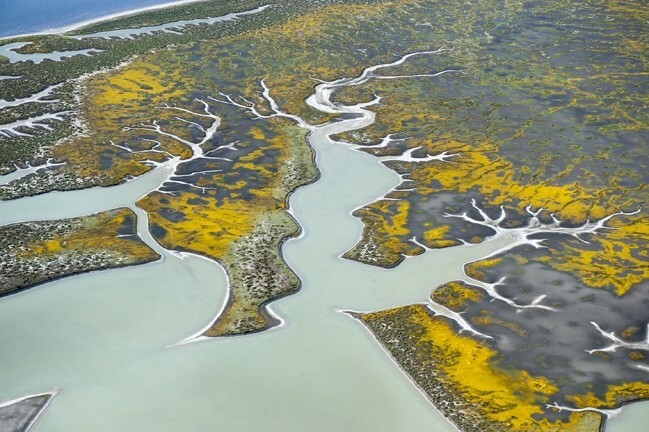 One of his ongoing projects is a series of images of the Colorado River Delta, which flows into the Gulf of California (also called the Sea of Cortez). When not shooting from his Cessna, Dewey also works as an architectural photographer. His documentary work for the Historic American Building Survey has included San Francisco’s Mare Island Naval Base and the Saturn V rocket test stands used in NASA’s Apollo and Skylab programs. Dewey often flies to such jobs, easily logging 500 to 600 miles per day. While an experienced pilot and very much at home in the air, Dewey has had his share of white-knuckle moments while flying. SHIFTING SANDS: Bill Dewey’s “Coast to Carrizo: Aerial Photographs of San Luis Obispo County” hangs at the San Luis Obispo Museum of Art, 1010 Marsh St. in SLO, through June 2. Museum hours are 11 a.m. to 5 p.m. every day but Tuesday; visit sloma.org for more information. Despite—or perhaps because of—the seemingly precarious nature of piloting a small aircraft solo, Dewey speaks of flying as a transcendent, personal, and humbling experience. Arts Editor Anna Weltner often takes to the air in the office. Contact her at aweltner@newtimesslo.com.